I know it's not officially strawberry season, but I had some on hand and just couldn't resist making them for breakfast on Sunday. I always take the kids out to a local strawberry patch each June to pick our own strawberries. From the time they can walk, they each have their own container in hand and help pick tons of this juicy fruit. Of course they probably eat just as many as they put in the container, but who's counting? We usually end up with around 10+ pounds and then comes my favorite part! I search through all of my recipes deciding which ones I have to make, usually realizing that I don't have near enough fruit or time to make everything on my list. Last year we made 3 trips out there and it still wasn't enough....so that made me determine I simply need to grow my own haha! These strawberry muffins are one of my favorite to make and made a few appearances at my farmer's market booth last year. Each time they were an instant hit! They are super easy to make, you should even have all the ingredients on hand and I love that they make 2 dozen so I can stick the extras in the freezer for mornings when it's hectic. I think you'll also love the addition of the cinnamon, it's just enough for you to taste and compliments the strawberries. It won't be long and strawberry season will be in full swing! I can't wait, if you've never taken the time to go pick your own; you need to! 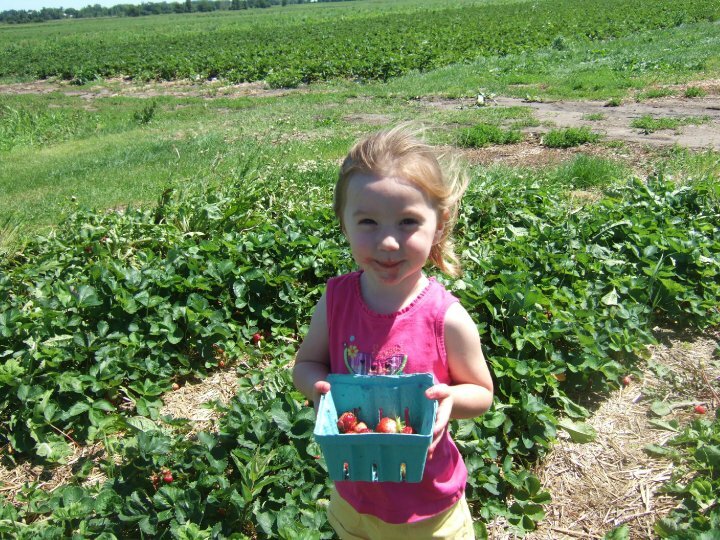 It's so much fun for the kids and there's nothing that beats fresh, locally grown produce; it tastes so much better! In a large bowl combine flour, sugar, cinnamon, baking soda and salt. In another bowl mix strawberries, oil and eggs. Stir in dry ingredients just until moistened. Fill greased muffin cups (or use paper liners) 3/4 full. Bake at 350 for 18 minutes or until muffin tests done. Makes about 24. Store leftovers in an airtight container or freeze for later use.